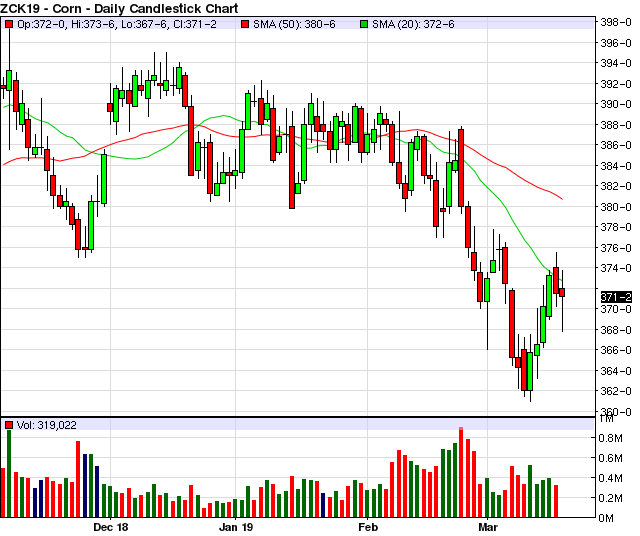 Corn has been on the defense so far this week after posting a weekly reversal higher last week. The last Commitment of Traders report showed the funds at a new record short position, which is strange for this time of year. A bullish spark could set of significant short covering, but what could that spark be? While it is early to start getting excited about planting delays weather has certainly been a topic of conversation lately. A historic storm ravaged much of the Midwest last week leaving much of the western corn belt under snow and/or water. The flooding in parts of South Dakota, Nebraska and Iowa is tragic and has caused major logistical issues to say the least. It is difficult to think that everyone will be ready to plant in a few weeks. The trade deal with China seems to be getting closer. Next week we will have our two top negotiators flying to Beijing. The following week the top Chinese negotiator will be in the US. If deal were to get done it could be good for corn. China seems to be in the market for a significant amount of ethanol and may also buy a sizeable amount of corn. I still am concerned about ethanol becoming more and more of a drag on corn. The EPA and the Small Refiner Exemptions are reducing the impact of the RFS and lowering corn demand. We need to get this fixed before we can get too exciter about the upside potential in corn. Next Friday (March 29th) the EPA is having a public meeting in Ann Arbor, Michigan. Consider attending if you want to be heard. Another roadblock for a corn rally could be the amount of corn stored on farm. There is a lot of corn still yet to be sold in both old and new crop and that could offset some short covering by the funds. However, it seems to me that a lot of cash corn was sold in the beginning of March as producers took advantage of cold but mostly clear weather to make some moves before planting. It is that time of year where many of us choose to free up some cash. This brings up an interesting question. If producers have mostly sold enough "for now" and funds are at or near record short positions who is left to sell this right now? Especially if it starts sounding better about getting the trade deal done? I think there is a good chance the spring lows are in for corn now. Certainly a lot of things could change that (Bad deal, ethanol), but the market seems set up for a modest recovery at minimum.